A 3-year-old tells all from his mother's restroom stall. My little guy, Cade, is quite a talker. He loves to communicate and does it quite well. He talks to people constantly, whether we are in the library, the grocery store or at a drive-thru window. People often comment on how clearly he speaks for a just-turned-3-year-old. And you never have to ask him to turn up the volume. It's always fully cranked. There have been several embarrassing times that I've wished the meaning of his words would have been masked by a not-so-audible voice, but never have I wished this more than last week at Costco. At this point I started mentally counting how many women had been in the bathroom when I walked in. Several stalls were full ... 4? 5? Maybe we could wait until they all left before I had to make my debut out of this stall and reveal my identity. He started to gag at this point. I saw that my wait 'em out' plan was unraveling. I sheepishly opened the door, and found standing outside my stall, twenty to thirty ladies crowded around the stall, all smiling and starting to applaud. My first thought was complete embarrassment, then I thought, where's the fine print on the 'motherhood contract' where I signed away every bit of my dignity and privacy? But as my little boy gave me a big, cheeky grin while he rubbed bubbly soap between his chubby little hands, I thought, I'd sign it all away again, just to be known as Mommy to this little fellow. Note from Jen: We've all had mortifying motherhood experiences like this which ultimately lead us to appreciate our own mothers even more & cause us to realize the absolute joys of being a mother. I am so blessed to have two women in my life that I am privileged to call mom--the woman who housed my growing body for 9 months & has spent 33 years raising me and the amazing mother-in-law who has adopted me into her family and treats me as one of her own. I am so grateful for the life lessons each of them continue to teach me & the sacrifices they have made to be my "Mom". I love you both! ahhaha. So funny. 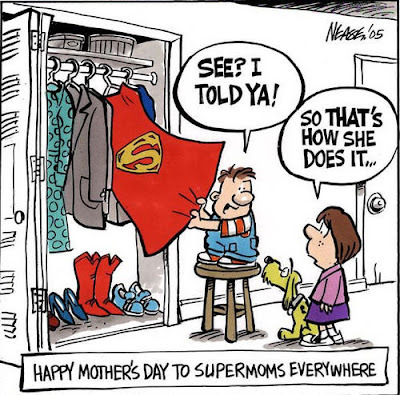 Happy Mothers Day all!